GODREJ & BOYCE Mfg. Co. Pvt. Ltd.
Electronics: Precision Test Equipment : Oscilloscopes, Vacuum Gauge Meters, Decibel meters, Ohm meters, L-C-R meters, Digital Multi-meters, Color TV, Car audio systems, speakers, etc. Computers: Repairing of Monitors, Hard Discs, Precision Power supplies 340 W- S M P S, Floppy Drives with alignment, Mother boards, printers, etc. 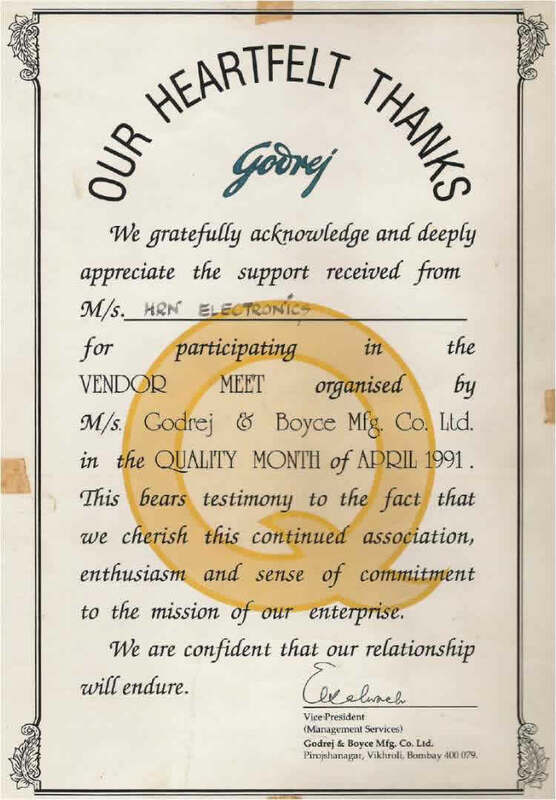 Quality Control : As a testimony of our work, Godrej Co. had conferred the Quality certificate in the year 1991. My company used to give repairing guarantee for 6 months on the works orders of Godrej Co. Because, I believe in good quality work with genuine spares. Electronics : Precision Test Equipment : Maintenance of Oscilloscopes (From Bombay And Nasik), Digital Multi-meters, etc. Computer: Repairing of Mother boards, Floppy Drives with alignment, SMPS, Hard - Discs, etc. All items in computers and also, Digital multi-meters for repairing works. Procured, one year A.M.C successfully, for printers as per the tender requirement. Repairing of Oscilloscopes for Engineering division, Old Santa Cruz, Air port and submitting the project report for 'Deployment of Plotter with Universal Hydraulic Test Stand Machine'. Model : 102219, also, for engineering division. Repairing of Monitors and Printers, Assembling Ultra Sonic kits, strictly on Excise gate pass only. © HRN Electronnics Services. All rights reserved.